The Settings area within the Administrator console enables you to make various changes to the program’s appearance. Any changes that you wish to apply to accounts on an individual basis, need to be done from within the user console of each student. By logging into your Admin console and selecting the Student tab within the Settings section, any changes you make will be applied universally across all student accounts. To tailor settings on a student-by-student basis, you will need to work from the Settings section on each student’s individual console. Giving students the opportunity to make their own choices about settings, such as the background and hand colour, enhances students’ feelings of being in control of their own learning and is recommended. Some students will need your help to do this. 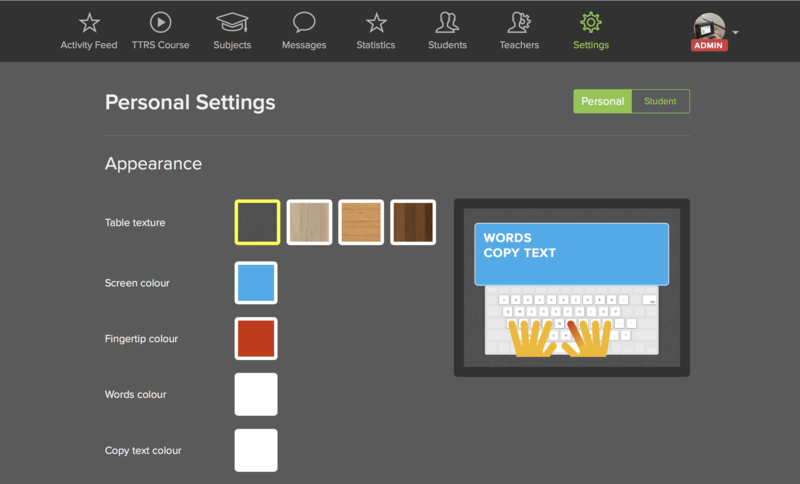 Individual changes are made within the Settings of a student’s user console. From here, various amendments to the program’s appearance can be made. When turned on (the default position), Copy Typing shows a line of words on the screen, with words typed underneath. When turned off the student over-types the words which change colour as they proceed. If the One mistake option is on, a typing error triggers the fingers to show a backspace and no further typing is permitted until the spelling is corrected. It prevents characters being repeated if the key is pressed for too long resulting in an entire line of characters – which is particularly seen in students who have fine motor difficulties. The student’s typing speed (WPM - Words Per Minute) settings can be adjusted from here. Various Voice options are available. Be aware that selecting the USA Male voice will trigger the word lists which use US spellings. The in-built Training facility can be turned on or off. The Spacebar option can be adjusted to reflect the student’s thumb preference. The Backspace and Space commands can be set so they are announced during the module. The Praise option provides the applause at the end of the module. For those with special physical needs, the Hands option provides the facility to display one-handed typing. The Keyboard and Hand colours can be set to Light or Dark according to the student preference. USER’S PASSWORD is where the login password can be changed. This password can be viewed within the Users section of your teacher console at any time. The user’s email address can be added under the EMAIL INFO section. You can also change the avatar image from here if you wish. PERSONAL INFO is where you can amend the username if needed.